Three greedy men capture Aquaman to use in an exhibition, and use gas to control him. Ah! This story features the first appearance of Ark the Sea Lion, a friend of Aquaman who shows up in multiple stories. Ark is the first sea creature that is actually named by Aquaman, but definitely not the last. Back in World's Finest #6, Peers and Rogan had this same plan, but never carried it out... The readers are informed in the opening text box that they must root for Aquaman in the story... I'm not good with telling Golden Age writers apart, but this story seems very different than previous ones, and my guess is that it has a new writer... Coburn somehow knows where Aquaman's Sea Fortress is... After Jerrod and Skol kill Coburn, they lose the secret of the drug that pacifies Aquaman, which eventually allows him to escape... Two children attending the exhibition note that Aquaman doesn't look happy to be in the tank as part of the show... When Aquaman breaks free from the gas, the same two children notice that Aquaman looks happy again... Aquaman is shown outswimming a human, a dolphin, a shark, and a sea lion (presumably Ark), all in the same tank. How'd they get the shark to race and not eat? Finny Friends Report: Aquaman chats with Ark the Sea Lion and Ark responds with repeated "Ark!" calls. It's unclear if Aquaman understands him at this point. Aquaman battles a hammerhead shark, batwing ray, octopus, and barracuda. A giant sea turtle saves a thug, apparently at Aquaman's request. And finally, Ark bowls over the bad guys, knocking away their gun. 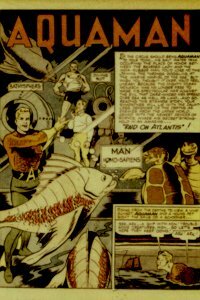 Captured/Knocked Out report: Aquaman is captured when he swims close to the bathysphere, and held by a net. He isn't knocked out. Doctor Coburn uses a gas to make Aquaman willing to sign contracts and be willing to perform in the exhibit.